Listen to Rapid Drug Detox, do what they say, and you too will give yourself one of the greatest gifts of your life. I am an Ivy League, Top 5 MBA graduate and Managing Partner in business. I have 4 children and a wonderful wife of over 25 years. I live in an affluent neighborhood and both teach school and usher at my church. Nice guy and life, right? By virtue of multiple broken rib injuries 4 years ago, I become a consistent, everyday oxycodone / hydrocodone user for most of the first 2 years and virtually all of the last 2 years. This became the nightmare of my life that was on the verge of ending my career and then potentially my marriage and relationship to my wonderful kids. It had already killed one of my friendships. I still tear-up when I look back and think how close I came to losing it all. Let me reach into your heart and mind if you are sitting in anything like the shoes I wore until recently, you cannot win this thing. It will take you down into the abyss. As I was told, there are only 3 outcomes in life for someone in your position (an addict), locked-up, covered-up, or sobered-up. I cannot believe how I was living my life. I was so self-absorbed and unfocused, always taking pills and planning my next lies and tricks (and frankly, crimes) for securing more drugs. The time and expense wasted is mind-numbing. What in god’s name was I doing? It finally dawned on me that I was a dead man if I did not get off these drugs and having tried on my own, I had reached the point where I knew I simply could not go through it alone. I had tried 4 times, once successfully for nearly 3 weeks. But I always tricked myself (the disease in my mind working me over) that I could still just have fun once and then come right back off of them. It does not work, I went back every time. I am a free man today through a combination of this rapid detox procedure, the absolute care they gave me for 48 hours after the procedure (you might need another day or 2 if on oxy or something stronger – I had dropped down to only hydrocodone) and my conviction that the continued path I was on could only lead to absolute misery in the end. Please, please do this for yourself. I am a very different person. I had forgotten what it was like to have natural energy, a clear, focused mind and a caring heart. Today I do so much more every day, my relationships at work, with my wife and kids, my extended family, and even my friends, are all growing like flowers in the Spring. It is the most wonderful feeling that I have my life back and will never, never, never, ever go back to those drugs. I will never return to the god-forsaken living nightmare that I was trapped in. If you are far enough into this nightmare that you know you cannot get off on shear willpower (and if you are reading this, you probably are), then do this program and do it with these people. I found them to be the only ones who cared enough to have the right process down over those key 3-4 days (only the first 1-2 are a bit tough) when you emerge out the other side a FREE person. The alternative (on your own or through regular detox) is so, so much more painful and an order of magnitude longer. I pray for you to obtain the understanding that you are a walking train-wreck and take the initiative to get yourself to these people. 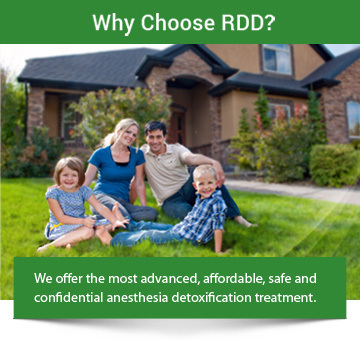 Listen to Rapid Drug Detox, do what they say, and you too will give yourself one of the greatest gifts of your life.